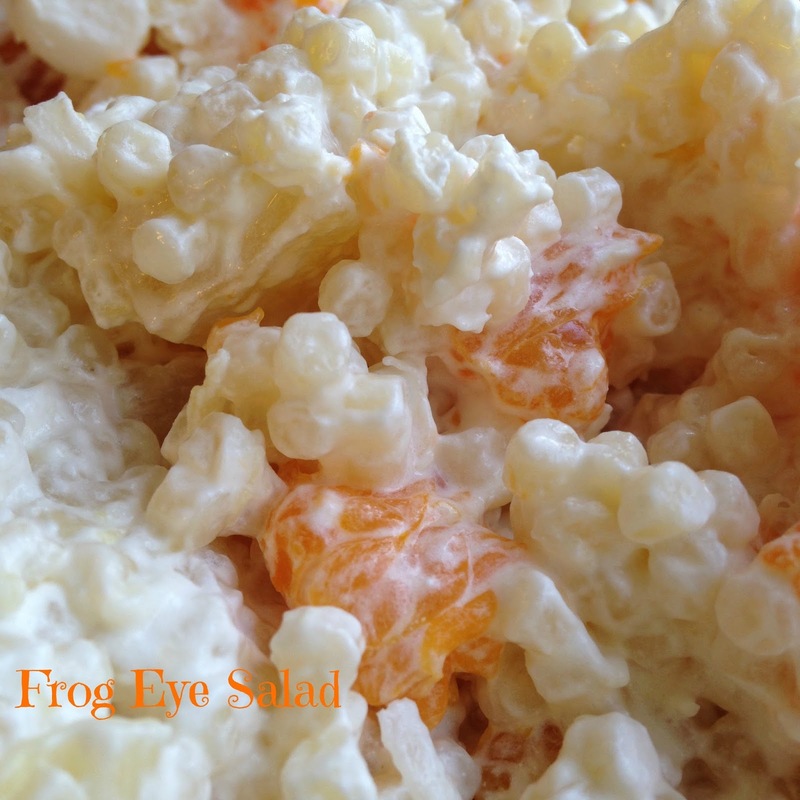 Frog Eye Salad is best described as a creamy, fruity, fruit salad made with pasta. I thought my grand-kids would like this salad when I told them the name..but it turned out we all loved this salad. I had never of Frog Eye Salad. I’m really not sure why? Maybe because it’s not a Midwest “salad” I did some research and found out it may have originated in Utah. It’s still very popular there. 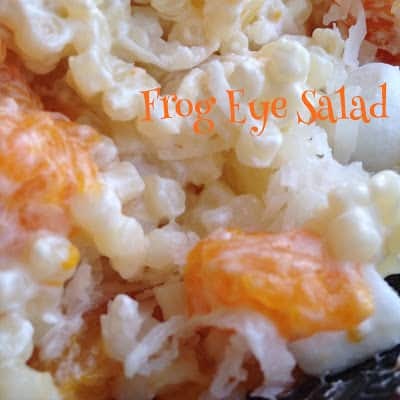 If anyone knows anything about Frog Eye Salad please leave us a comment below. We’d love to learn more about this scrumptious salad. Frog Eye Salad is very similar to Ambrosia Salad. Ambrosia salad is a very popular southern-style salad, that is made with mini marshmallows, pineapple, mandarin oranges and coconut, then combined in a pudding/whipped cream mixture. Frog eye salad is made with cooked pasta, crushed pineapple, pineapple tidbits, mini marshmallows, mandarin oranges and a cooked filling. Mix it all together with whipped cream or a non-dairy whipped topping and you have delicious! Frog Eye Salad is named after the pasta used in the salad. The small little pasta called; Acini di Pepe. This pasta is said to look like little eyes, hence the name. I have also seen recipes for this salad using ring macaroni, instead of the Acini di Pepe pasta. I think the next time I make this salad I’m going to use both….more eye-like, I think:) This recipe makes a lot of lip-smacking, yummy salad. 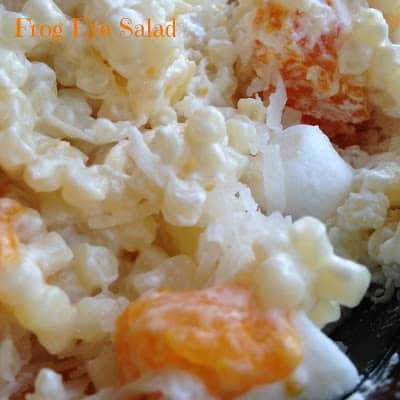 If your invited to a party tomorrow to celebrate Memorial Day or over the summer if your asked to bring a dish to pass, Frog Eye Salad is definitely a dish everyone will love. Note: Use drained pineapple juice and mandarin orange juice plus enough water to equal 1 3/4 cups. In a saucepan, combine sugar, flour, 1/2 teaspoon salt, pineapple juice and eggs. Stir and cook over medium heat until thickened. Remove from heat; add lemon juice and cool to room temperature. Bring water to a boil. add oil, remaining salt and cook pasta until al dente. Rinse under cold water and drain. In a large bowl, combine the pasta, egg mixture, mandarin oranges, pineapple and whipped topping. Mix well and refrigerate overnight or until well chilled. Before serving, add marshmallows and coconut. Toss and serve. My friend used to make Frog Eye Salad and it was always so good. Glad to have this recipe, it looks delicious. Thanks so much for sharing with Full Plate Thursday and have a great weekend! I wonder if you could use tapioca instead of the pasta for a dessert? I wonder if you could make it with tapioca instead of the pasta to make it more of a dessert? I make something very similar to this- its called Pepe Salad (some people are put off by that name – pee pee). Ha. I'm not. I like the name of your salad too. That's how I felt when I saw the name too. Couldn't wait to try it either..it's great. What fun! I love the name of this, my kids would have gobbled this up when they were little. I bet they would gobble it up now, too! Looks really yummy! So many great flavors in this salad! and they really pair well together. Thanks for stopping. I love frog eye salad, but my recipe is a little different than yours. I am so happy to see that your recipe does not require a box of jello. The scratch made stuff is always so much better. I love the sweet citrus taste of this stuff. Who knew a pasta salad could taste so good? Hi Patti, I saw many recipes that called for using boxed pudding mix but I agree, the made from scratch is so much better…..makes the salad! !